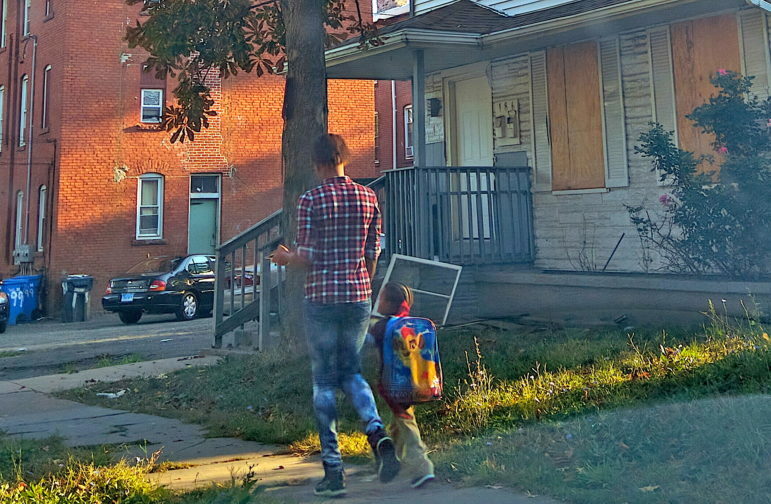 A student walks by one of the many boarded up houses in an impoverished neighborhood in Hartford on the way to school. The following essay — one of four to be published this week — appeared in the recently released 2018 KIDS COUNT Data Book, Taking Stock: Considering the Future of Child Well-Being and Family Opportunity in Connecticut. It is published by The Connecticut Association for Human Services (CAHS), an affiliate of the Annie E. Casey Foundation’s KIDS COUNT network, a group of child advocacy and research organizations using data to promote smart policies on issues affecting children and families. CAHS tracks and reports on indicators of child and family well-being. Decades of research continue to confirm the obvious; poverty is bad for children. As evidenced by a 2015 report from the Urban Institute, the more time children spend living in poverty, the worse their outcomes are across nearly every domain. Compared to their peers who are never poor, the nearly 40 percent of children who experience poverty at some point during their childhood fare worse in educational achievement and employment, teen births, and even involvement with the criminal justice system. When we fail to alleviate generational poverty we prevent our children﹘and our society as a whole﹘from reaching their fullest potential. Here in Connecticut, we take pride in the idea that our state is a great place to raise children. On average, our children are healthier, do better in school and are more likely to go to college than children in most other states. But Connecticut is also the poster child for our nation’s growing crisis of income and wealth inequality. We are home to 17 billionaires and 106,8920 households with over a million dollars in investable assets, and also to roughly 92,600 poor children. These figures aren’t symptoms of a glitch in our economic structure. They are the hallmarks of a system designed to produce and uphold disparate outcomes, chief among them the accumulation of vast wealth by the few and its corollary, persistent family poverty. Several important figures help to ground the issue of child and family poverty in our state. Connecticut is a notoriously high-cost state. Here, the cost of living for a family of four with two small children is $78,000 (based on the United Way’s minimal “survival budget”). We know from the census that roughly 66,300 or 31 percent of children under the age of six live below 200 percent of the Federal Poverty Level which is $52,000 for a family of four. This means that far more than a third of Connecticut’s small children live in homes where they struggle to pay for their basic needs. What does it say about the state of our economy and the state of the American dream when more than one in three Connecticut children lives in a household barely able to get by? In Connecticut, where the education children receive is determined by their zip code and the value of their parents’ home, it’s apparent that education reinforces, rather than alleviates, barriers to becoming middle class. Children, and young children in particular, bear the brunt of growing up in poverty, but they are neither responsible for or in control of their economic circumstances. At the same time, data also show that many parents across our state aren’t able to secure the decent wages and stable employment needed to support their families. Statewide, more than a quarter of all children live in households where no adult has secure, full-time employment. Parents are working—Connecticut’s 4.4% unemployment rate is just slightly above the national average—but many are stuck piecing together part-time employment or seasonal work. For those whose skills and education are a match to the available full-time work, wages are still insufficient. For decades, we as Americans have believed that jobs were the best solution to poverty. But our national obsession with putting poor people to work has not remedied our current situation. Employers have incentives not to hire full-time employees so as to avoid paying benefits. At the same time, low-income workers risk losing critical public assistance if they take on more hours or accept a raise – we have a system that requires people to work without allowing them to prosper. Social scientists have dubbed this paradoxical split between national economic growth and stagnant national economic mobility the “productivity-pay gap,” emphasizing how over the last four decades, the rise in corporate profits, productivity, and GDP has been accompanied by no real growth in wages for people without a college degree. With or without the trendy moniker, it’s clear that our economic system is not optimized to produce good outcomes or opportunities for every child. Second only to the promise of more jobs, we have seen education as a means to move up the social and economic ladder in this country. Certainly, education can connect children to economic opportunity, and can strengthen societies. When public high schools began to crop up around the nation starting in the mid-1800s, it produced the basis for the technological revolution as a whole population became educated to a higher standard. California’s history of providing free college tuition to state residents, at least through the 1980s, fueled its robust economy. But in Connecticut, where the education children receive is determined by their zip code and the value of their parents’ home, it’s apparent that education reinforces, rather than alleviates, barriers to becoming middle class. Americans have always loved a rags-to-riches story, and, perhaps because we’ve found “pull-yourself-up-by -your-bootstraps” narratives so compelling, we’ve forgotten that they are the exception, not the rule. Ours is a system that is designed to provide wealthy kids with a great shot at staying wealthy. Here in Connecticut, while the number of poor children ebbs and flows with changes in the economy, the share of children of color who live in poverty remains persistently and dramatically higher than the share of white children in poverty. Often, we are quick to point out disparities in economic well-being across race and ethnicity, without acknowledging how we got here. The growth of a white American middle class, driven largely by access to affordable higher education through the G.I. Bill, didn’t happen overnight. Two-hundred-fifty years of enslavement, followed by 100-odd years of Jim Crow-enforced racial segregation, paired with institutional racism, structural biases and discrimination, and decades of policy violence are all part of the narrative we should be telling about why we fail to lift up every child. The American Dream should be rebranded as the Canadian Dream. Harsh as that may seem, a recent comparative study by the Organisation for Economic Development and Cooperation (OECD) confirms that a child born into a poor family in Canada is twice as likely as their American counterpart to reach the middle class. Running down the list of structural differences that drive Canadian social mobility: chief among them single-payer healthcare; a strong public school system; and access to affordable post-secondary education, it is hard not to wonder whether our nation’s growing inequities are the symptoms of misplaced governmental and societal priorities. More than 50 years into the “War on Poverty,” we must admit that our national actions, along with our local, state, and federal policies, are failing families and children. Certainly, we have to continue fighting for the types of policies that help to blunt the force of our broken system. Passing paid family and medical leave and predictable scheduling legislation, expanding subsidies for high-quality preschool, and reducing tuition costs might make it easier for American to reach their fullest potential. But at the end of the day, we must confront our apathy toward poverty. We have to acknowledge that, in becoming so quick to blame poor people for being takers, we have forgotten the outrage sparked by Michael Harrington’s The Other America: Poverty in the United States. We must look inward to question why we have deemed poor people morally culpable for their circumstances. And then, we recommit ourselves to the fight to end generational poverty. 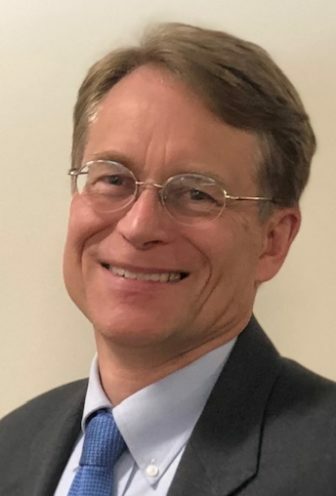 Merrill Gay is Executive Director of the Connecticut Early Childhood Alliance.